I love cupcakes, but I also love doughnuts! June 5th is National Doughnut Day. Krispy Kreme and Dunkin Donuts are offering free doughnuts, but they are not the only places where you can find sweet fried dough. 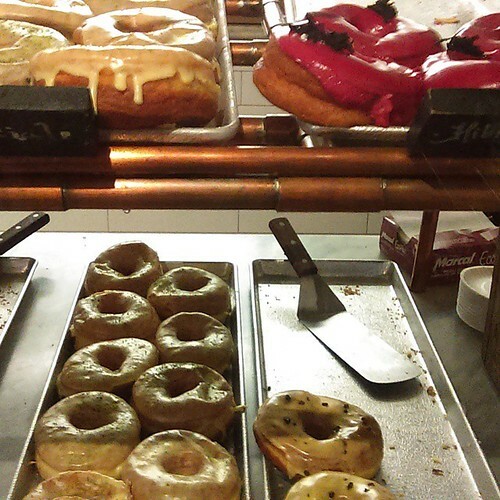 Foursquare has compiled a list of 20 doughnut places around the United States. I would add Revolution Doughnuts in Decatur, GA. Many thanks for posting this list! You did omit my favorite donut shop in Wells, Maine, and Speedy Donuts in Norwalk, CT; but I am thrilled that there are so many quality independent donut makers throughout the country.